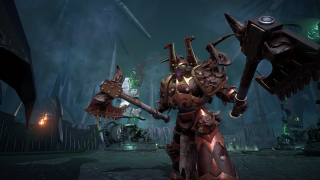 Warhammer 40,000: Dark Nexus Arena, the free-to-play MOBA that was announced back in February, is now available on Steam Early Access. The released-but-not-finished version of the game includes a new Soul Hunter game mode, in which players compete to be the first to deliver 50 souls to the Dark Nexus at the center of the map, and a new playable character called the Lychguard. The Lychguard is "the first Veteran from the Necrons, the most requested faction during closed beta testing," according to the announcement. A quick trip to Wikipedia tells those of us not immersed in 40K lore that Necrons are "an ancient race of skeleton-like robots who are awakening from an aeons-long slumber and fighting to reclaim the galaxy from the younger races." They have strong ranged firepower and tough armor, and some can "reassemble" themselves after being destroyed. They're also soulless, and so they have no psykers, which leaves them more vulnerable than other races to psychic attacks. Dark Nexus Arena takes place in the Dark Eldar capital of Commorragh, where enslaved characters (that would be you) are pitted against one another in gladiatorial battles to the death. Unlike many MOBAs, it has no lanes, towers, or minions, and uses a "skillshot" control scheme that "controls like a shooter while maintaining the teamwork and character progression of a MOBA." Warhammer 40,000: Dark Nexus Arena is free, but offers microtransaction purchases for vanity items that will transform characters from "standard Veterans" to more famous WH40K characters. More info is up at darknexusarena.com.